Made by Caroma Industries Ltd in Australia, Oceania, 2004. This sectioned toilet is an example of the Caroma Smartflush toilet suite range that features new flushing technology designed to minimize water consumption. It was submitted by Caroma as part of its entry into the 2005 Australian Design Awards and examined during the Awards judging. The Caroma Smartflush toilet range received an Australian Design Award and Powerhouse Museum Selection in 2005. Consists of a cut-away toilet suite secured to a wheeled blue back and base board. The toilet is made from white ceramic and has sections cut away to show the inside components of the cistern and interior of the pan. The edging of the cut-away is painted with red paint. The base board fits neatly into a wooden crate. 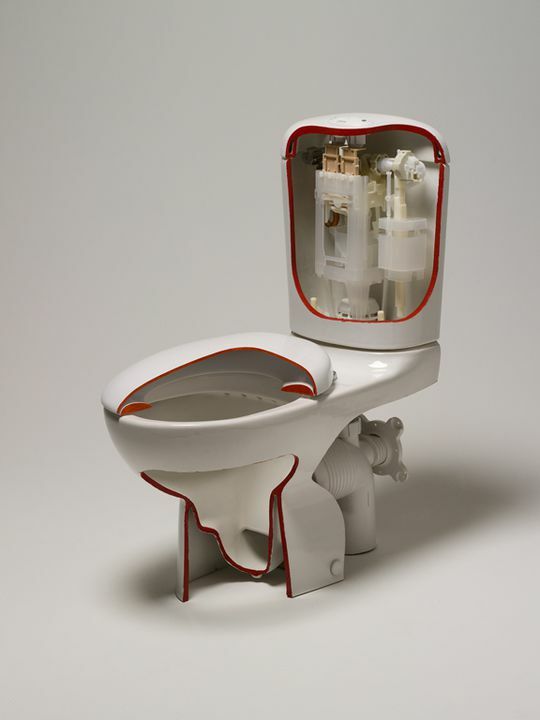 This toilet suite was sectioned by Caroma in Sydney for entry into the Australian Design Awards in 2005. The Caroma Smartflush range is the result of a five year long intensive research, design, development and testing program by Caroma's two research and development teams in Sydney and Adelaide. Two water-authorities (Brisbane City Council and Yarra Valley Water) were also involved in field trials, performance evaluation, public health issues and consumer feedback. The Caroma Smartflush 4A toilet suite range comprises 5 individual toilet suite models all featuring new flushing technology designed to maximise efficiency and minimise water consumption. These toilet suites use 4.5L of water for full flush and 3.0L for reduced flush. All 5 models comply with Australian Standard AS1172, have achieved the Water Services Association Australia (WSAA) AAAA rating, and were the first products on the market to achieve this level of efficiency. Traditional toilets use 11 litres for every flush. In 1993, the Caroma dual flush toilet suite became 6.5 litres maximum for full flush and 3.5 litres maximum for half flush (6/3). Prior to the Caroma Smartflush range, this was the best water flushing technology available in Australia (3A water-efficiency rating). Flushing with less water is not simply a matter of reducing the water in the cistern. The design challenge is creating sufficient energy and cleaning power with a smaller water volume. The major factors in toilet performance are clearing and cleansing the pan, and transporting waste along the sewer pipe. To perform these roles effectively with less water, the entire flushing process had to be redesigned so that the cistern, pan and trap work as one optimised unit. - Flow rate increase of approximately 60%. - Discharge energy increase of approximately 140%. - Valve buoyancy increase to cope with the increased hydrodynamic forces. - Better control of water displacement during valve lift to give a more positive opening action. - Hydraulic characteristics were matched to the toilet pans developed by the Sydney team to provide optimum pan clearance and drainline travel. - Only 2 material types were used to allow for easier end-of-life segregation and recycling. - Compatibility with greywater and rainwater supplies by designing a synthetic elastomer seal with superior chemical resistance. - Superior reliability by designing to cope with water-borne contaminants and algal build-up. - Approximately 15% reduction in product cost through design for manufacture, and future automation potential for further efficiency gains. - Pan sump and rim design for optimum water flow efficiency. - Waste clearance performance complying with the 6L requirements of AS1172.1 with water volume reduced to 4.5L. - Drainline carriage (trailing water volume) complying with the 6L requirements of AS1172.1 with water volume reduced to 4.5L. The Caroma Smartflush range were the first toilets to be awarded the WSAA 4A water efficiency rating. A typical household replacing a traditional 11L toilet can save around 50,000 litres of water per annum. Information sourced from the Caroma Smartflush 2005 Australian Design Awards entry. This sectioned toilet suite was presented by Caroma to the Australian Design Awards at Standards Australia offices in Sydney for the the judging of the 2005 Australian Design Awards in March 2005. It was then transferred to the Museum and displayed in the 2005 Australian Design Awards exhibition from July 2005 - June 2006. The Caroma Smartflush toilet range received an Australian Design Award and Powerhouse Museum Selection in 2005. Over 190 products were entered in the Australian Design Awards in 2005. The judging panel recommended 49 of these products receive an Australian Design Mark and of these, 20 products for an Australian Design Award. The products receiving the Australian Design Award were announced at a dinner and awards ceremony on 22nd April at Melbourne Museum. At this ceremony the recipients of the Powerhouse Museum Selection awards for 2005 were also announced. The history of Caroma began in 1956 Charles Rothauser, when a Hungarian immigrant, renamed his plastics company "Caroma" and began manufacturing bathroom products, including the world's first one-piece plastic toilet cistern. In 1980, with $130 000 government assistance, Bruce Thompson of Caroma developed a cistern with two buttons and flush volumes (11.0 litres and 5.5 litres). This wasn't easy because the toilet bowl had to be redesigned to make sure less water could still remove the waste. Thompson's Duoset cistern saved 32 000 litres of water a year per household when it was trialled in a small South Australian town. Caroma's success led to legislation in every state but NSW to make dual volume toilets compulsory in new buildings. In 1994 the company completely redesigned the toilet in stylish porcelain in a modern 'organic shape'. Its 6 and 3 litre dual flush cistern and matching bowl halved the amount of water normally flushed away. This combination of style and environmental awareness attracted attention in the tough European sanitaryware market and exports began soon after. The product is now shipped to more than 30 countries worldwide. The Smartflush range is the most recent innovation in design from Caroma, further reducing the flushing volumes to 4.5L and 3.0L. In 2006 Caroma was a wholly owned subsidiary of GWA International Limited, a Brisbane based, Australian owned company, with diverse interests including Sebel Furniture, Rover Mowers, Dux Water Heaters, Dorf Tapware, Clark Sinks and Gainsborough Hardware.